Someday my Cord will come! A DECO RIDES drawing board project. Complete with scotch tape and cutmarks! Another of the most beautiful cars ever built (1934-37) was the 810 and 812 Cord. 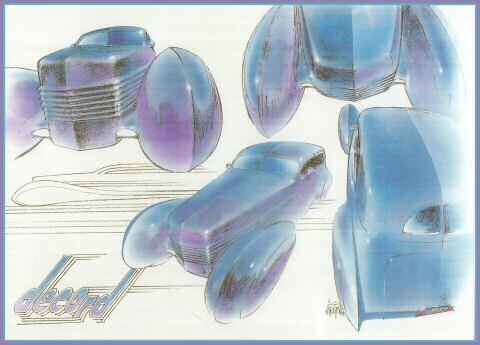 Design credit goes to Gordon Buehrig and his unheralded clay modeler, Vince Gardner, who had a lot to do with it and the beautiful second generation Auburn Boattail Speedster. In 1990, during one of my regular visits to the Auburn-Cord-Duesie Museum in Auburn, IN, I bought a postcard of an 810 4-door Beverly sedan, took it home and immediately chopped it and dropped it with an X-Acto knife and tape. 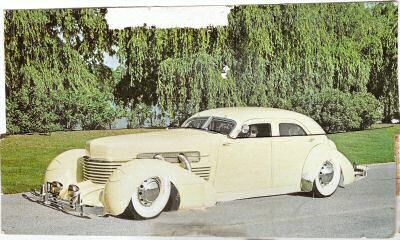 That post card so motivated me I went out and bought a '41 Huppmobile Skylark (body made from the same dies as the 810 Cord) because I felt it was a sacrilege to cut up a real Cord. While I've always loved fine coachbuilt American and European cars, this marked my entry into the world of Deco designed automobiles, eventually leading to launching DECO RIDES in 1999. Influenced primarily by Figoni and Falaschi, I started fooling around with fully enclosed "pontoon" fenders and hired Art Center School graduate Ed Newton from Dublin, OH to collaborate on the "DECO CORD." His art is shown here for your enjoyment. The Hupp marked my first involvement with Ramsey Mosher of Ram's Rod Shop in Dover, DE. At my direction Ram sawed up the Hupp, flipped the top half of the front Hupp fenders upside down and swapped 'em side to side and welded them onto the bottom of a pair of rotting cord fenders I bought. I was getting deeply involved in the Cord Project when, as fate would have it, I visited a Lincoln Swap Meet in PA and got severely bitten by the Zephyr bug. I sought out a '39 3-window Lincoln and jumped into the "SCRAPE"Project with both feet, putting my Cord on the back burner. My chopped and 30% done all metal DECO CORD sits in my garage today awaiting my future attention (and cash flow.) Anyone wishing to infuse dollars to become a "partner" on this project, or to become the owner of the car, providing DECO RIDES can supervise construction and completion, contact me. Some day my Cord will come . . .